Abstract: The theory of outbidding states that terrorist, insurgent, and rebel groups use violence to capture a greater share of their audience’s resources. I argue that opponents of these groups should anticipate this dynamic, which potentially alters their demands. 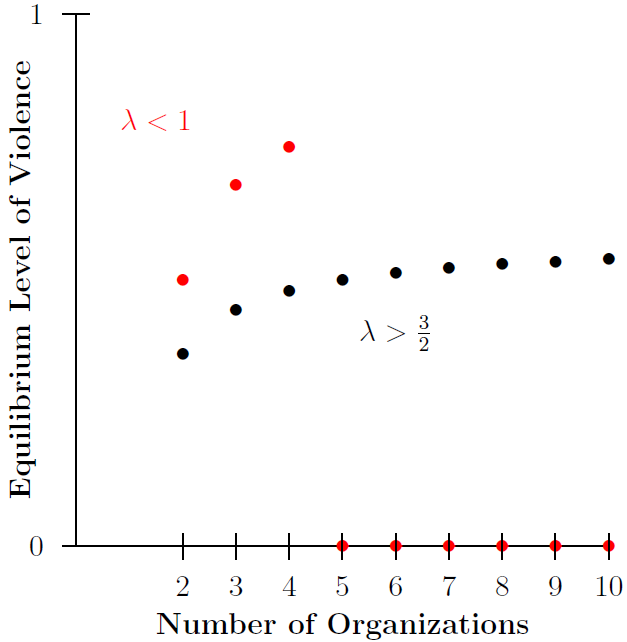 Although a seemingly obvious implication of outbidding is that violence increases as the number of groups (and thus competition) increases, I show that this may or may not hold if the demand is endogenous. This is because targets, fearing group competition, limit their aims. The results help explain empirical inconsistencies regarding outbidding. Using comparative statics from the model, I then discuss the challenges to making valid empirical inferences regarding outbidding.